I am often telling customers that “making your banner is the easy part-what’s tough is deciding how to put it up.” What we are showing here is how our good customer Waterville Valley solved the problem on a ski slope. The vinyl banner is held in an aluminum frame with a large metal foot that keeps it stable. This kind of fixture also is relatively easy to move from place to place. 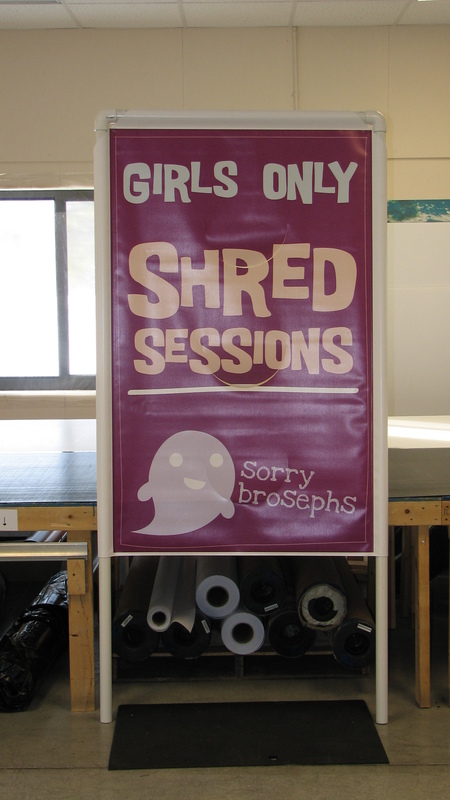 We print a lot of ski area banners, usually on our across the street vinyl, since it’s good to -30 degrees. Regular vinyl becomes brittle at about -5 degrees, so for ski area use it’s not very good. Located as we are in ski country, we solved the vinyl low temperature problem many years ago. This entry was posted in Vinyl Banners and tagged Banner Stands, outdoor banners, ski area banners. Bookmark the permalink.